Sula Fest is back! In its upcoming 12th edition, Sula brings back a weekend full of great music, food, shopping, and lots and lots of wine. But wait, there's more. This SulaFest, you can stomp on grapes, camp under a sky full of stars, witness breathtaking sunrises, enjoy foot massages, tarot card reading and spend some quality time with your loved ones. 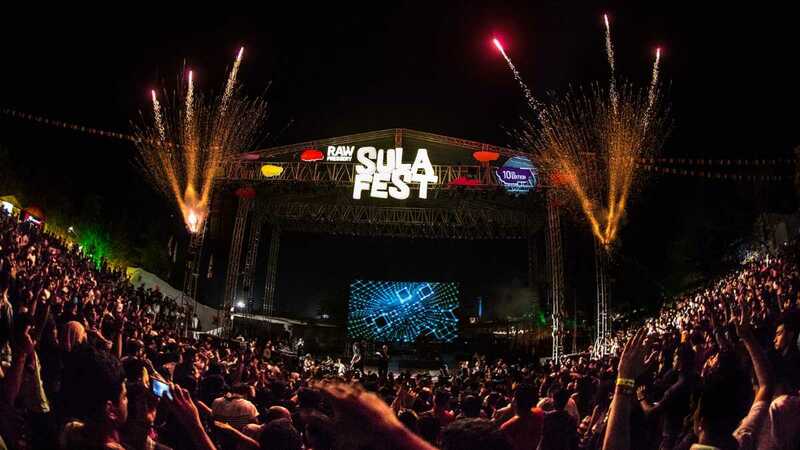 SulaFest 2019 promises a memorable weekend you would look back to even years later. Please note that the ticket prices don't include the costs for food, drinks, and accommodation. Sula Fest is a Gourmet World Music Festival held at Nashik Vineyards in Maharashtra. The combination of soothing music and quality wine results in only one thing: an abundance of fun. With headlining acts from a wide range of international and Indian music artists, this year, Sula Fest promises to be bigger and better. This is no surprise as the last 5 years of the fest was a complete sell-out (hint: don't delay in booking your tickets if you don't want to regret staying home and looking at your friends' Insta stories having the time of their lives). Sula Fest is all about indulging yourself! Head over to Sula Fest Bazaar for an amazing selection of gourmet food, drinks, quirky merchandise from funky brands, and fun games and activities. The food includes a plethora of cuisines, many from renowned restaurants such as Little Italy and Soma. Along with a huge wine collection from Sula, there will also be other imported wines to experiment with your taste buds. Not a wine person? Fret not, as there will also be a fine variety of spirits and beers from all across the globe. Sasha: The headliner for Atmasphere, Sasha has won the DJ Mag Number 1 DJ in the world award 4 times and is also a Grammy Award Nominee. A global phenomenon in the electronica genre, Sasha is set to fire up the stage in Sula Fest 2019. Diatonik: Diatonik is taking over India with his music (literally) with tours in every other part of the country and over 30 countries abroad in the last 7 years. And this February, they take over Sula Fest 2019. Sashanti: Sashanti is ready to take the fest to the next level with his techno music. Ankytrixx: From performing up in India's hills to down by the beaches, Ankytrixx will now float through Sula Fest 2019 with their passionate music. Nikhil Chinapa: Who hasn't heard of Nikhil Chinapa? A man who doesn't need an introduction, this VJ turned DJ has curated some great electronic music, especially for Sula Fest this year. Juliet Fox: Juliet is a rising star in the techno music industry. She is known for her great collaborations and record label music. Make sure to check her music out only at Sula Fest 2019. Oona Dahl: Oona's mesmerizing music will cast a dancing spell on you. Put on your best dancing shoes because Oona Dahl is set to perform this year as well. Shankar Mahadevan: Bollywood would be incomplete without Shankar's sensational music. Relive him again this year at Sula. Jungle: The British sensation is all set to headline the fest this year. Currently the hottest band in the whole of UK (and other parts of the world), Jungle is coming to India exclusively for Sula Fest 2019. Discover other noteworthy artists including Lucille Crew, Mother’s Cake, Hallouminati, Forelock and Arawak, Paraphoniks, and Malfnktion create the hottest music scene at Sula Fest this year. There are other accommodation options as well. Ibis, Taj, Ginger, Express Inn, and Formule1 are some hotel options to choose from which are only a half hour drive away. Sula Vineyards are located in Nashik, 175 km from Mumbai (3 and half hour ride) and 225 km from Pune (4 and half hour ride). You can either take a taxi from your respective city or a train till Nashik Road (a more economical option). Book an Uber or Ola or take a local taxi from the station to Sula Vineyard. Turn your weekend into an unforgettable one. Join in the jollification and make merry at Sula Fest 2019!